Wadi Bih, Oman’s running festival, is the local runner's equivalent of a Glastonbury or Burning Man where we all get to indulge in an entire weekend of running with a bunch of fellow addicts. There is camping, shared food, and a range of running options to suit every age and ability. Whilst to some the way it is organized leaves too many unknowns for them to tolerate, it may well be the reason the atmosphere has such a good sense of fellowship. This is not the event to sit back and let others organize for you, this is where you get involved and help each other. Where Glastonbury has its rain and mud, this year's Wadi Bih had the most extreme conditions anyone can remember. John Young has run the event for 25 years and confessed he had never seen such a dramatic first day. As much as the elements were a challenge for the runners, it tested the organizers to the limit. Of course the secret to handling ultra running is accepting the unexpected and confronting challenges as part of the race, rather than seeing them as distractions. No race like this goes as planned nor can you train to run a certain pace. For most runners doing the 72km solo event this means stepping up to the start line tooled up with a selection of seemingly essential ultra running gear and nutrition that the sponsors Salomon do so well to market. For me and my colleagues from Dubai’s Desert Road Runners, we came with something even more effective - years of local knowledge and a team. Collaboration began on a WhatsApp group chat. Shared food, shared cars, support with Arabic at the border, and we are all soon at the venue for the evening. Whilst the intrepid and well-equipped soloists drove their 4x4's onto the beach and setup seaside tents, our group opted for the solid car park and a flat piece of grass on the hotel grounds to set up our encampment, where the tent pegs could enjoy some traction. Massimiliano, our cheery Italian friend and de facto chef, got the BBQ going and we were soon all sat eating good food in good company. In the background, a quiet Australian was running along the final kilometers of the course just to remind himself of the route and make sure the legs were ready. He was Jeremy Curran and he held the current course record for the 72 kilometer solo run. Before the 4:30am start, we had Hasan, our Syrian insomniac, to wake us in his usual unsquashable mood. Anyone in the camp not running the 72km solo event was still up helping make tea and supporting fellow runners with their final preparations. In typical Dubai running character, our settlement was a truly international one. Australians, Brits, South Africans, a Syrian, a Belgian, a German, an Italian, and an Irishman, and all runners. The race organizers offer a bag drop one third of the way into the 72km race, which is also the two-thirds point on the out-and-back course. The location is ideally positioned in terms of terrain and changing conditions. On the way up, as the temperature rises, you can drop your head torch and switch gear whilst eating and drinking. On the way down, it is a chance to get some sun protection on before the hotter, flat finish. We had a second option, Massimiliano, who was planning to run in the relay on the second day, switched from chef to team car driver. He drove the course with our Belgian friend Carine who joined Massi for company and to offer some camera work. They would join us in the Wadi at sunrise and provide a mobile food and kit station. After a race briefing that warned of strong winds and cold temperatures, we assembled on the start line in three distinct groups; three elite men ready to race in nothing but shorts, vests, and head torches (including the quiet Australian), the soloists with their instruments on their backs, and the Dubai collective dressed for our normal weekend gig. The usual inflatable starting arch had blown down in the night and been replaced by a simple ribbon across the sand - a subtle warning of what lay ahead and one we all ignored. From the start, the elites disappeared into the night. Behind them our merry band trotted along sensibly, enjoying each other’s company, chatting and joking in blissful ignorance of what lay ahead. There are a few steady kilometers of flat road before the course turns right up a steep slope and enters the mouth of Wadi Bih. We had barely entered the jaws of the wadi before the wind slapped us all in the face with cold hard sand. In a scene reminiscent of Gladiator, the seemingly ragged band immediately bunched into a tight group and took turns taking the lead. One of the soloists gladly hitched a ride too. And so we stayed for those first few hours, working together in the dark, rotating the lead, sharing drinks, and making sure everyone was on board. It was an experience I think we will all cherish for some time as it rarely happens in these events. Up ahead Grant Beerling had settled into a long solo race for third place and a sharp time leaving only the local Omani Sammy Alsaidi to take on the mighty Jeremy Curran. Sammy tried to break away from him but as the incline increased Jeremy tracked him down. As Sammy was turning right up a steep turn in the high-walled Wadi, all he saw ahead of him was a huge shadow of the pursuing Jeremy cast on the rock face by the headlights of a car behind. With typically silent modesty, the quiet Australian had roared. Sammy dropped soon thereafter and the race was down to Jeremy and Wadi Bih. Both seemed determined to win. As daylight arrived so did our Italian-Belgian support vehicle to lift our spirits, offer us drinks, and take our torches. With light, fuel, and some brief respite from the sand blasting lower down the Wadi, the group imperceptibly shifted from pacing to racing. Desert Road Runner David Cox was clearly having a great day and whilst a few of us hung on to his heels, the group began to break up. We briefly convened at the bag drop point and listened to the warning of high winds and 5 degree temperatures. Those who didn't add at least one more layer and some glasses paid a heavy price. The stage after the bag drop is where the run really becomes a test. The narrow Wadi gives way to a wider valley and up ahead a snaking path up a huge hill. Just before we reached the foot of the climb, Jeremy Curran came by on his way home. In typical fashion he took time to warn us about a big puddle just round the corner. We clapped and gawped in awe before stepping into said puddle. The final climb to the summit is over one kilometer of steep bends which are best done walking until you round the summit and run a few final kilometers of undulating mountain top to reach the turning point. The steep slope is a good moment to eat while you are walking and to shift the strain to a few different muscle groups. Normally the top of the climb then offers some great running with stunning views and the knowledge that you will soon be past half way, heading mostly downhill for the rest of the day. This time it was a little different. Even before reaching the final bend before the top, the whining sound of the howling wind through was unnerving. David, Hasan, and I came over the brow to be hit by the strongest wind I have ever experienced. The only solution was to run in between the gusts and just try to stay on your feet when it blew hardest. At least it would be fun coming back. Or so we thought until we saw Grant on his way down almost being blown on his face and unable to talk thanks to the cold. It was to be a tough day out for Grant, not least because he only knows how to race until there is nothing left, which leaves little margin for error. Our band was down to three and with David's pushing we managed to run down a few people. It had been dark at the start, so we had no idea how many people were ahead of us but we were getting close to the turn and only a few people had passed us including our fellow teammate Diarmuid O'Malley who had run the whole first half alone in pursuit of a personal best. Another soloist had passed by us singing to the sky with joy at the thought of the easy downhill finish. What he didn't know is that the second half is where the real running is required. When we passed him later down the track, he was muttering to his shoes. We began to realize that a top ten finish might await each of us if we kept this up. The turn allows everyone to see just where they stand and the change in terrain benefits some runners more than others, and running downhill on tired legs is just as much of a skill as running up. After the steep descent comes a deceptively long run down the steepest part of the Wadi to the bag drop point. It is a stunning place and unlike most years it was pleasantly cool. The cold of the mountain top was too severe for some: it had ended the run of our friend Hazim who was close to hypothermia at halfway. For a brief moment at the bag drop point Diarmuid, David, Hasan, and I overlapped before splitting up again. My refueling strategy required a lot more downtime at each pit stop than the others. As much as I felt the need to eat and drink without moving, I equally craved the mental break from continuous motion. For the remaining third of the race, the gaps ebbed and flowed, but all the while David's pace was taking him through the field. Hasan was beginning to look stronger with every kilometer too. Diarmuid and I began to wobble a little. Diarmuid's early pace was beginning to cost him and for me a lack of distance training, being hit by a rock in the chest, and entering a distance I had never run before was beginning to tell. When you start hailing bootless cries to the wind you know you are beginning to crack. It would have been a long, lonely slog to the finish for both of us but with less than 10K to go the team kicked in again. On a long stretch of road, I turned to see the support car pulling and Massi switching to his third role as pacemaker. All I needed to do was fall into step with his pace and he would see me through to the finish. Behind us our friend and accomplished ultrarunner Gerda Steyn did the same for Diarmuid, having just smashed the 30K course and won that race outright. The oxytocin produced by such pure camaraderie is extraordinary and will bond us all as friends for ever. Despite the wind and now driving rain, we were cheered on by friends who had finished the 30K or had arrived early for the relay on the following day. At the front of the field, Jeremy Curran had shaken his fists at the wild Wadi and the Wadi had recoiled. His relentless focus and pace took him to a new course record of 5:28:15. Under any conditions the time was extraordinary, but on that day it really was the stuff of legend. Despite Grant arriving an hour after Jeremy in second, and collapsing like a rag doll at the finish, Jeremy was on hand to pick him up and congratulate a fellow finisher. Such grace did not go unnoticed. With two runners in and one podium spot left, David Cox stormed in and grabbed what must be one of his most satisfying results to date. One soloist came in fourth followed by the irrepressible Hasan in 5th, me in 6th, and Diarmuid in 7th. Five of the top seven finishers came from our team, showing just what an advantage we had. Training is helpful, but fellowship was critical on the day. I had visions of crossing the finish line to the cheers of the crowd before relaxing outside with a refreshment, maybe a dip in the sea, and then an afternoon recounting tales of how bad it had been up the Wadi. What none of us had considered was the effect of the storm on our encampment. The finish line had been reduced to a plastic pole on the floor amidst something akin to a hurricane-hit beach in Belize. The cozy huddle of tents we left that morning was destroyed and mine was the only tent still standing. Two tents on the beach had been blown into the sea and others were completely buried in sand drifts along with various cars. With tent poles snapped, fabric ripped, and the rain increasing there was little chance of managing another night under the stars. There was still time to stagger into the showers, struggle into dryish clothes, and limp the long yards to the buffet and prize giving. The cans of Coca-Cola and a succession of podium visits for the team had us all cheering like drunken brunchers before the whole room gasped as Jeremy's position and time was read out - a new course record in the most unlikely conditions imaginable. It was a shame to break up the festival, but after 72 kilometers in those conditions, we all needed some warm Dubai comfort. We left the field for the relay runners to have a go the following day. The Wadi Bih event is usually held in the first weekend in February. Currently, 30km, 50km, and 72km solo races, along with a 50km team race, are held on the Friday. 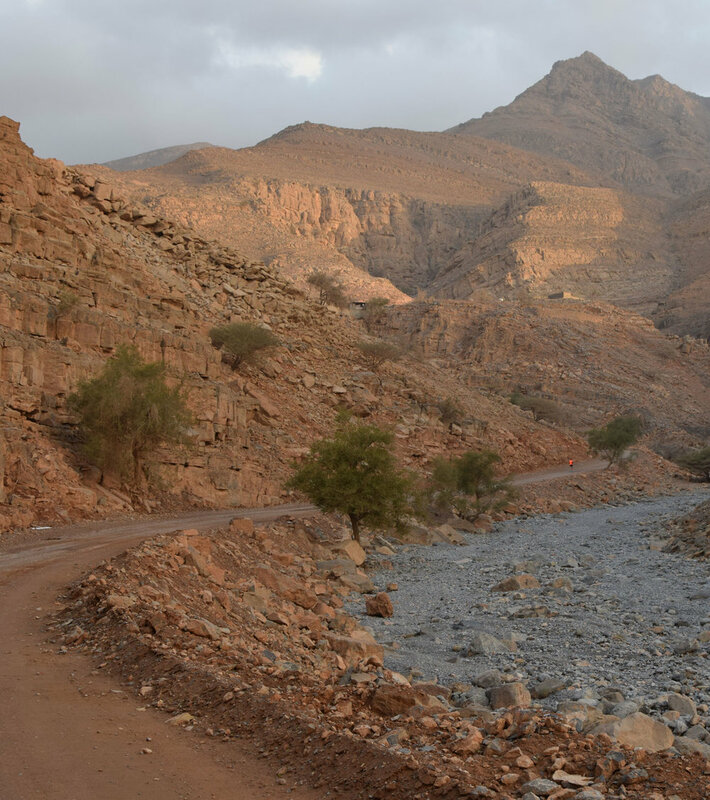 The 72km team race takes place on the Saturday, though this year the course for the 72km teams had to be shortened because rain had made the upper part of the wadi unsafe. In its early days, the event was a point-to-point race, starting in the UAE emirate of Ras Al Khaimah, and crossing the mountain range that forms the spine of the Musandam peninsula to end on the beach in Dibba. However, restrictions were introduced on crossing the mountain border between the UAE and Oman, and in recent years the course has been an out-and-back route, starting from the Golden Tulip hotel by the sea in Dibba and climbing through the spectacular Wadi Bih as far as the summit, before returning. Runners and supporters should also be aware that there are tight regulations around crossing the coastal border between the UAE and Oman at Dibba in order to participate in the event. The event managers will organize the necessary border pass, but participants must follow their instructions about submitting passport and visa details in advance. For more information please visit the event website.